* Available in 5" x 5" and 5" x 7", each box kit comes with Ampersand's signature Claybord surface on the lid and unfinished wood sides for a completely customizable fine art box. 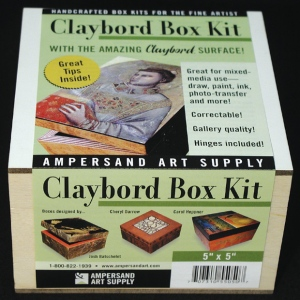 * The Claybord top can be painted with any type of water-media, collaged, photo-transferred onto, and more! * All sides are custom paintable and made with Ampersand's premium quality wood materials. * Hinges are packed inside to attach later. * Use the box kit to extend your art, for home decor, or to make someone an artful gift.